Israel Ritchie, known as Tolon, is a 37-year-old shark fisher from López Mateos, Mexico. His family has hunted sharks off the Pacific side of the Baja California peninsula for generations, selling the meat these days for around U.S. 70 cents a kilogram (2.2 pounds) and the shark fins for 50 to 100 U.S. dollars a kilogram. But relying on shark for an income puts Tolon in a precarious place. Tolon has been forced to think of ways to make his craft—and career—more sustainable, increasingly relying on organizations such as Iemanya Oceanica, a U.S.-Mexican nonprofit that is working with 12 Mexican fishing communities to help them find long-term economic security. Iemanya Oceanica is advising Tolon and other fishers to partially transform their fish-based economies and to start thinking of shark-based ecotourism as a way to make money and preserve stocks for limited fishing. Many fishers are already making plans to convert their 22-foot (6.7-meter) boats, known as pangas, into sport-fishing vessels that tourists will board for catch-and-release fishing trips or diving expeditions to observe sharks firsthand, Tolon said. Some researchers believe shark stocks have declined worldwide by 75 percent since the late 1980s, triggered, in part, by Asia’s appetite for shark fin soup. An increased demand for fins—combined with the depletion of other commercially fished species, such as cod, tuna, and swordfish—has changed sharks from an unwanted bycatch into a valuable target species, according to experts. Tolon’s catch is sent to Mexico City, where wholesalers sell the meat to food vendors, who in turn sell shark burritos for about a dollar each. The highly prized fins usually end up in soup that can sell for as much as a hundred dollars a bowl in China, the U.S., and elsewhere. Groups like Iemanya Oceanica say education is key to protecting Mexico’s sharks. They emphasize that sharks play a critical role in marine ecosystems, ensuring the long-term health and stability of fisheries and, in turn, economies. Sharks are top predators, which means they maintain checks and balances on other species by feeding on sick or weak fish, seals, and other marine life. But sharks are slow to breed and are being overfished. In the absence of sharks, populations of certain other species can mushroom, depleting some marine regions of resources needed to sustain ecosystem balance. Tolon and 30 other fishers in his community are helping Iemanya Oceanica track the size and species of sharks in the Pacific Ocean and the Gulf of California, the two bodies of water divided by the Baja California peninsula. They continue to hunt Galápagos, hammerhead, blue, and whale sharks, but make sure to release pregnant and young animals, Tolon said. Iemanya Oceanica’s executive director Laleh Mohajerani said involving fishing communities in research is an important conservation tool. “It has not been easy,” she added. Some fishers are resistant to ending their harvest of sharks now for a possible payoff later. Peter Klimley, a shark expert based at the University of California, Davis, believes groups like Iemanya Oceanica can succeed if indigenous fishers start to see sharks as a renewable resource, and if certain areas become off-limits to fishing. “What makes the decline so poignant is that there’s so much interest in ecotourism to dive with them,” said Klimley, who has received funding from the National Geographic Society’s Expeditions Council for his own research on hammerhead sharks. The economic transformation has worked in several Mexican seaside communities that used to rely on hunting sea turtles but have now switched to ecotourism. Local shark fisher Tolon is hoping to set an example by diversifying his business. He’d also like to sell his catch directly to people in Mexico City. Some species would benefit from being on government lists of protected species. 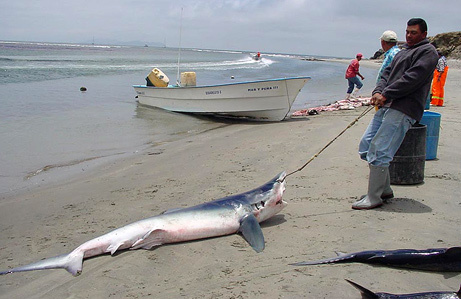 In 2007, for example, the Mexican government placed the great white shark on a list of protected species. It is now illegal to reel in the great white, once one of the fishers’ prized catches because of its size. But Klimley and Tolon agree that classification won’t change the situation without patrols, similar to the way Mexico assigns patrols to protect sea turtles. They recognize that patrolling beaches where female turtles spawn is a far easier task than sending naval patrols to protect the shark habitat in the waters that flank the Baja California peninsula. This entry was posted in National Geographic, Print and tagged Mexico, National Geographic. Bookmark the permalink.